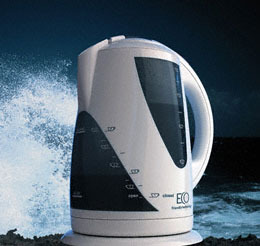 Eco Kettle, Efficient Boiling | OhGizmo! Whenever you use your kettle to make coffee, you boil the entire contents. You actually use much less than that, usually, leaving a good portion of that spent energy to go to waste. Now, I don’t hug trees in my spare time, but it seems like a good idea to try and streamline the process a little, if only to save on evergy bills. Sounds good to me. It’ll cost ya $70, right here. Story VIA Metaefficient.